Camel Lake is an ancient body of water located 30 miles west of Tallahassee, Florida in Liberty County. Geologists haven’t been able to determine if it’s a limestone sink lake or an aquifer positioned near the surface of the land. It’s not a large lake being 500 yards in diameter, and it is sometimes referred to as a pond. Today, open pine savannah consisting of longleaf pine, turkey oak, and wiregrass surround the lake. Cypress trees, Spanish moss-covered live and laurel oaks, myrtle, and titi grow adjacent to the water. In 1986 three scientists took a core of the lake bottom. They counted pollen grains, catalogued plant macrofossils, and carbon dated differing levels of the core. The information they gathered provides a diary of changes in plant composition in the vicinity of Camel Lake over the past 40,000 years. Shoreline at Camel Lake, Florida. A core of sediment taken at this lake found Pleistocene -aged pollen dating to as old as 40,000 years BP. They found plant macrofossils in abundance as well including needles resembling those from longleaf pine, leaves similar to those of live oak, a species of quillwort no longer found south of North Carolina, and many other species. The period of time from ~40,000-~31,000 BP is known as the Mid-Wisconsinian Interstadial. The climate during this era was at least as wet as today, and maybe more so, because the glacial ice covering much of Canada was in a meltwater phase, and more moisture flowed into the atmosphere. But it was still the Ice Age and temperatures were slightly cooler than those of today, reducing evaporation rates. The cooler temperatures and increased precipitation fostered a mesic forest in northwest Florida dominated by high numbers of oak (comprising 40% of pollen totals), hickory, elm, ash, and hornbeam. Cypress, sweetgum, sycamore, and myrtle were also common. Chestnut didn’t range this far south in this part of Florida during Colonial times, but during the Mid-Wisconsinian Interstadial, chestnut pollen was abundant in the air. The authors of the below referenced paper believe the pollen was from the American chestnut, rather than chinkapin which is a small bush. The pollen from these 2 related species can’t be distinguished, but the amount suggests it originated from great forests of chestnut, not small understory bushes. At the beginning of the mid-Wisconsinian Interstadial pine was still common, but pine pollen dropped to less than 20% as the climate warmed. Pollen graph from the below referenced paper. Shows the pollen levels from the last 40,000 years. Click to enlarge. Between ~31,000-~29,000 a transitional phase occurred. The climate rapidly began to become colder and drier as the Laurentide Glacier over Canada resumed expansion. Pine increased in abundance and oak remained common but chestnut, beech, and hornbeam disappeared. Marsh elder, a plant that thrives in fluctuating water conditions, was common, indicating dramatic dry/wet seasons. The Last Glacial Maximum, the coldest stage of the most recent Ice Age lasted from ~29,000 BP-~14,000 BP. Pine pollen increased to over 80%. Oak, hickory, and cypress were still present but at low levels. A low diversity and density of plants covered the landscape. Shallow water plant species macrofossils, such as quillworts and small pondweed, dominate this level of the core, showing lower water levels within Camel Lake. A sudden change in climate is evident in the part of the core dating to between ~14,000 BP-~12,000 BP. Pine pollen immediately drops from over 80% to less than 20%. Hickory increased to an astonishing 25%. A forest represented by this much hickory has no modern analogue. Spruce represented 8% of the pollen and was soon joined by beech also representing 8%. A hickory-spruce-beech forest interspersed by small prairies where grass, ragweed, wormwood, composites, and marsh elder grew composed the landscape. Scientists initially misinterpeted the results of their study from this time period and proposed that this phase was the coldest of the Ice Age in Florida, colder even than the LGM. However, this was before the discovery of Critchfield’s spruce, an extinct species of spruce thought to have grown in temperate climates. Though Camel Lake produced no macrofossils of Critchfield’s spruce, it was probably the species exuding the pollen discovered in the core. Critchfield’s spruce macrofossils have been found in Louisiana and southwest Georgia (https://markgelbart.wordpress.com/2011/09/03/the-extinction-of-critchfields-spruce-picea-critchfieldii/) . With this in mind a better interpetation of the data indicates temperatures only slightly cooler than those of today and with increasing atmospheric moisture during this time period. How did a forest of hickory, beech, and an extinct species of spruce frequented with prairie openings become the dominant type of flora for 2,000 years here? I propose that megafauna and passenger pigeon foraging suppressed the spread of oaks which normally dominate in this type of climate. Llamas, deer, peccaries, bison, bears, and passenger pigeons gobbled up the acorns. But hickory nuts have hard shells, beech can grow from sucker roots, and spruce cones were not as palatable. These defense mechanisms gave them an advantage over oaks. Increased frequency of thunderstorms spawned lightning-induced wild fires that created the prairie openings. I regard this time period as harboring a particularly interesting environment in northwest Florida, the likes of which may never be seen again. This entry was posted on August 1, 2012 at 1:31 pm and is filed under Fossil Sites, Uncategorized. You can follow any responses to this entry through the RSS 2.0 feed. You can leave a response, or trackback from your own site. You are probably right on the numbers. People tend to think only in terms of climate and human impact on the environment and its various niches. But large animals and large numbers of smaller animals can (and do) have a tremendous influence on the ecosystems. Mammoths, mastodons, sloths, and other large mammals; and things such as gigantic flocks of pigeons meandering through an ecosystem are going to have a tremendous effect on it. Flocks of Passenger pigeons have been described as vacuum cleaners sweeping the forest floor clean of acorns. There were also important compositional changes within biomes that more finely reflect cooling and moistening during the last 3000 years. For example, the northern boreal forest and forest tundra in Québec became less dense and more shrubby (Richard et al., 1982), fir increased in importance in the boreal forest in Newfoundland (Macpherson, 1995), and spruce showed a marked increase as a significant component throughout much of the eastern mixed forest zone, particularly in the last 1000 years (see review by Schauffler and Jacobson, 2002). Thus, not only did the mixed forest retreat somewhat, but also it took on a more boreal character (Table IX). Similarly, western hemlock, a moisture demanding species, expanded into the subalpine zone of southeastern British Columbia starting at about 3.5 ka BP and mountain hemlock appeared about 2.1 ka BP, suggesting an opening of the forest there due to cooling (Rosenberg et al., 2003). 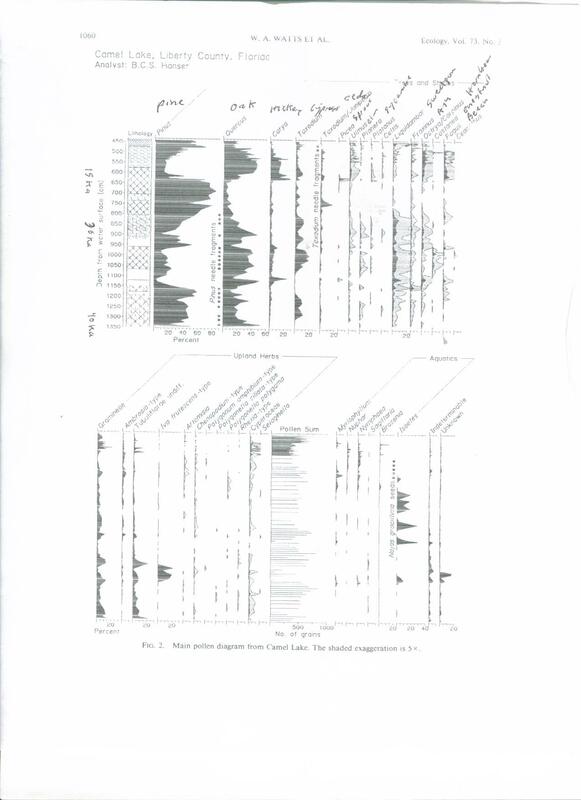 A high-resolution pollen analysis of a site in the northern edge of the deciduous forest in Ontario shows a strong decline of beech and concurrent rise of oak and white pine pollen in response to cooling during the Little Ice Age starting 1450 A.D. (Campbell and McAndrews, 1993). That study showed that the vegetation response remained in disequilibrium with climate for more than 650 years as individual species were advantaged or disadvantaged by canopy opening that resulted from the death of beech. Unfortunately there are few studies with such fine temporal resolution. The OLD CROW BASIN is the richest area for ice age vertebrate remains in Canada, having yielded more than 50 000 specimens representing nearly 60 mammal species. The bones are mainly exposed through natural erosion of the winding Old Crow River. They range in age from about 1.4 million years ago to about 12 000 years ago. Approximately 150 fossil localities are known within the Basin. Old Crow Loc. 94 is nearly 1.4 million years old and represents an Early Pleistocene interglacial. This fauna contains giant pika, several primitive rodents, mammoth and horse. Old Crow Loc. 47 is more than 180 000 years old and includes fish, bird, SHREW , “rabbit”, giant BEAVER and other rodents, “weasel”, WOLF , FOX , steppe mammoth, horse, CARIBOU and bison. The Old Crow Loc. 44 fauna of last interglacial age (about 130 000 years ago) contains remains of 7 fish, 7 bird and 31 mammalian species. Many of these (e.g. fish, DUCK , GOOSE , shorebird, beaver, giant beaver, MUSKRAT ) are aquatic, and suggest the presence of shallow ponds and lakes in a river floodplain, with spruce-larch forest nearby.